Our fun western signs and Texas signs are a perfect accent to your western decor! 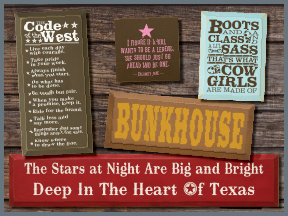 Give one as a gift to the cowboy or cowgirl in your life, or hang one up in your own "bunkhouse"! With over 40 colors to choose from, your solid wood sign from Sawdust City will look great anywhere! I wasn't born in the south, but I got here as fast as I could! She who dies with the most cowboy boots...wins!